As I have been reading YA dystopian trilogies lately, my mind boggles at the amount of work that must have gone into each one of those books. Especially now that I am a writer, I see my experiences devouring works with my speedy reading from the author’s point of view – so much time and effort for a reader to blow through a book in a day. After each series is finished, I hear thoughts in my head saying, “You’ll never be able to write a book like that.” In the past several months, I have learned better than to listen to those negative thoughts any more. Somewhere in the back of my mind, I have been trying to work out a way of writing a complex story that would work for me. I tend to be big-picture oriented. Looking at high amounts of detail or data to begin with always confuses and intimidates me. It’s hard for me to get a big handle on lots of little bits. So I thought: Why not start by outlining one big story arc from a character’s point of view? Then, keep layering on character arcs until you have an idea of what characters are together when. Then you can break it down into scenes or chapters. The last steps would be to go in and fill in all the details – the dialog, the descriptions, etc. After I thought of it that way, I felt a heaviness lift in my chest. Yes, I thought, that would work for me. As I said to a friend today, I have read a lot about time management and getting into some kind of artistic practice. I haven’t found a way to make it work for me until now. The accountability calendar I have been using that allows me to check off that I have written at least one page of journal writing a day, two blog posts a week, and three days of writing for a total of 2,500 words a week really got me going. I must not have understood myself well enough to know that I love to check off a list of things I have completed, that checking off that list makes me feel productive, and that it helps me to stay committed. Now, with my idea about writing big and then working my way into the details, I feel like another thing has clicked into place for me. What I have learned through my writing practice this year is that each person really does have to find out for themselves what will work. You can read all you want about how other people do it. It helps if you understand what makes you feel upbeat and productive and then work that into your life. That will help you along. But no one else can really tell you what methods will work for you. It’s just you, your understanding of yourself, and your ability to work with tools that work with you that will let you take that next small step towards your goals. 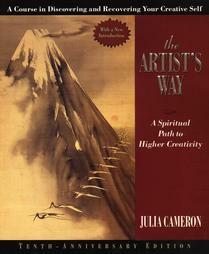 Last week, I decided to crack open a book that I have owned twice, The Artist’s Way by artist and writer Julia Cameron. I bought the book the first time when I was in my early 20’s. Back then, I was terrified by my desires to be an artist that I let the book sit on my shelf untouched for many years. I even gave it away at one point. Sometime last year, I bought another copy. Between graduate school, packing, and moving, the book remained unopened and unused. Back to last week: I decided that I would start adding practice writing in a journal in addition to my daily blog posts. I figured I would never get anywhere editing my novel if I tried to sit down without any kind of warm ups. I also decided to start reading the book. Ms. Cameron is a 12 week, theme-oriented weekly course where you tackle your creative obstacles one by one. She recommends two things: first, daily writing practice that she calls morning pages because you are supposed to write them first thing in the morning; and, second, taking yourself on an artist date wherein you go and have some fun to feed your creative side and keep your creativity burning. Both of these basic tools are easy enough. I already planned on doing the first suggestion, and I am thrilled to consider implementing the second. What shall I do next? What are your suggestions? Ideas?